Let’s start and see how we can draw these patterns using HTML5. To start drawing with canvas HTML5 we will only need a text editor and a browser. Please note that some of the features of HTML5 canvas are not available when using a local HTML file and they will require that the HTML file is on a server. We will get to that later in this tutorial. Inside this file we have a standard HTML structure and within the <body> element we have a <canvas id="myCanvas"> tag. We have set the ID attribute of canvas to allow us to reference it in our code. We have also indicated a 300px width and height for the canvas. On the next line we set the strokeStyle for the drawing context to a bright red #ff0000. This will determine the color with which we draw lines. The canvas uses a X,Y coordinates sytem where X indicates the horizontal offset and Y indicates the vertical offset. Positive values in this coordinates system go from top to bottom and left to right meaning that the point with coordinates 0,0 is at the top left corner of the canvas. Now, to draw the line on the canvas first we have to move to the starting point of the line using the moveTo() method and then indicate that we want to draw a line to another point by calling the lineTo() method. To actually draw the line on the canvas we have to call the stroke() method. Drawing a simple line on the canvas might not seem that much, but it’s actually a very powerful feature as you will see next because this will allow us to create more complex line patterns. First we modified the starting coordinates to a random position using Math.random() which returns a number between 0 and 1, multiplied by 300 – the width/height of the canvas. This will place the starting point randomly on the canvas. Then, inside a for loop we are drawing 10 lines. Please note here that we only call lineTo() without calling moveTo() for every line. That will draw a line between the starting point and the end point and use the end point as a starting point for the next line. We have also used the Math.random() function for generating random points for the lines. We have seen earlier that setting the canvas drawing color we have to set the strokeStyle property. What about setting how thick a line is? This is done by setting the lineWidth property. This property is set in pixels. We also added the beginPath() method. 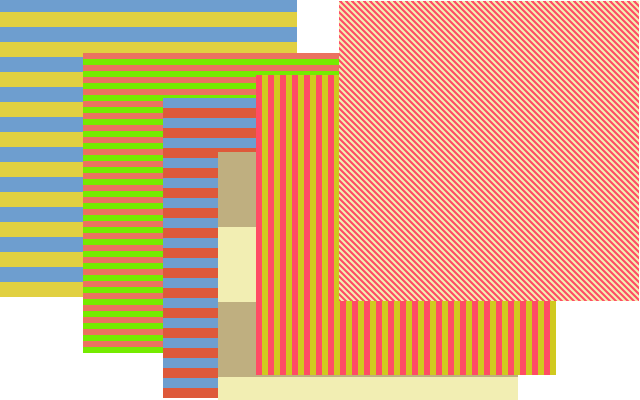 This was not required in the earlier examples since we considered all the lines as part of the same figure or path as it’s called in HTML5 canvas terms. As we want to change the color and thickness of each line, we call the beginPath() method to indicate that we are starting to draw a different path and therefore we can set different properties to it. Setting the lineWitdth property will determine how thick the lines will be and we used a random value between 0 and 40 for this. We should also notice that the stroke() method call is now within the for loop because we are now drawing individual lines (different paths) with different styles. Let’s now see how we can draw some seamless lines patterns. In the previous parts of this tutorial we have seen how we can draw random line patterns. This is useful and can produce some nice results, however, to get even more interesting results we will look at creating seamless patterns using lines drawing on the canvas. Seamless patterns or repeatable patterns means that if you place two such patterns next to each other horizontally or vertically they will line up perfectly. To create any seamless pattern we first have to be aware of the size of the pattern. In our case, since we are creating a line pattern on the canvas, the size of the pattern is the size of the canvas. Let’s make a horizontal line pattern or a striped pattern using two colors. Our canvas is 300 x 300 and to make a seamless patter we will have to draw an even number of lines alternating the colors. To determine the thickness of the lines we have to divide the height of the pattern by the number of the lines. The advantage of taking a mathematical approach to drawing the stripped pattern is that we can simply change the number of lines by changing the numberOfStripes variable and we get a seamless pattern of lines with the thickness of the lines being calculated automatically. I’m sure you got the idea by now, but let’s look at another line pattern – diagonal lines pattern. The question would be how to properly draw this patter such that it’s seamless. Because we have a square canvas, the easiest way to make a simple diagonal lines pattern is to draw the lines at a 45 deg angle. To do that we can start from a vertical lines pattern and simply move the starting point of all the lines to the left by 300. One important thing to note here is that we are allowed to use negative coordinates when drawing on the canvas. Anything drawn in the negative domain or outside the size of the canvas will not be visible, of course. 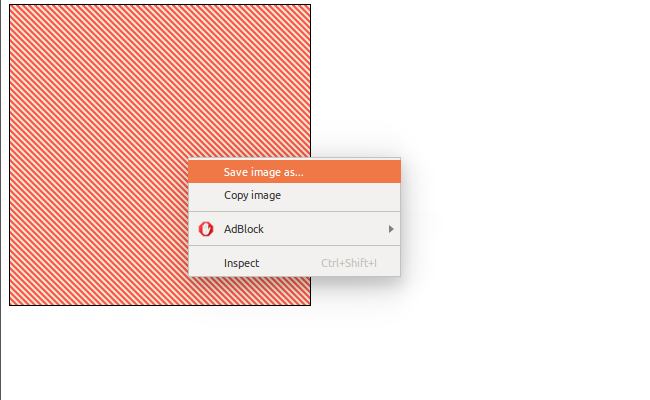 Using the mouse right click on the canvas will open up the contextual menu where you can choose the Save image as… option. 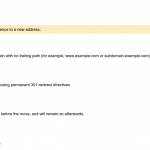 This will allow saving the canvas content as a PNG image. 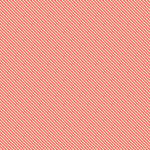 Once saved we can use the image containing the lines pattern in our designs just like any other image. The string indicates that it contains a PNG image content encoded as a base64 string. Don’t bother if that sounds too complicated, it’s actually a format that allows binary information to be stored as letters and numbers. And that’s exactly what we have in this string. This string is called dataURL and we can use it as an actual image in our HTML code by placing it in the src attribute of an <img> tag. we will get the canvas and an image displaying the same lines pattern as the canvas. Besides using the canvas image data in the src you can also use it as the background CSS property. If you want to learn more about that make sure you read my post Create dynamic backgrounds for websites using HTML5 canvas. I hope you find this post useful. 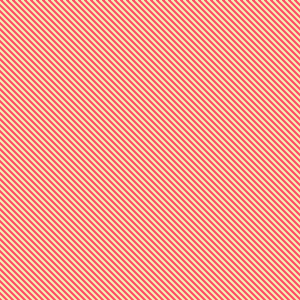 Now you have everything you need to create your own line patterns using HTML5 canvas.